THE factory street fighter is back with a vengeance. Aggressive, agile and purposeful; the legendary Triumph Speed Triple created the naked performance category back in 1994. But now it’s gone to a whole other level, with the introduction of a new RS model variant, with the latest generation of Triumph’s modern motorcycle icon offering the perfect balance of power, handling, and capability. While still being the original hooligan motorcycle, the Speed Triple RS has the highest level of specifications in the bike’s history, including a completely reworked 1050cc engine. More power and more torque – 110kW and 117Nm respectively – in an engine package that revs harder and spins up faster than ever before means the new RS is set to become a benchmark performance bike. Arrow sports silencers fitted as standard on the Speed Triple RS, along with high specification suspension, Brembo brakes and Pirelli Diablo Supercorsa tyres for improved rider comfort. There’s loads of new technology too, including a 5-inch full-colour TFT instruments with five rider modes, innovative LED illuminated switch cubes, new optimised cornering ABS and new traction control. Sharper and more focused than ever, the new Speed Triple RS offers a higher quality finish and detailing, including new high-gloss wheels and lightweight carbon fibre. The RS is available in two different colour combinations, Crystal White or Matt Jet Black, both with a matt aluminium rear sub frame, red wheel pinstripes, red seat stitching, and more premium RS decals. 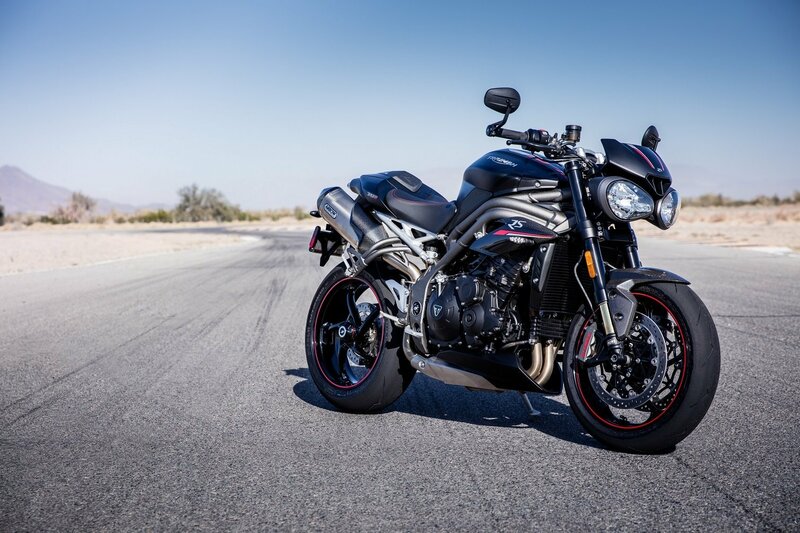 Pricing for the 2018 Triumph Speed Triple RS will be available at the end of February. We will update this story once we have those details.